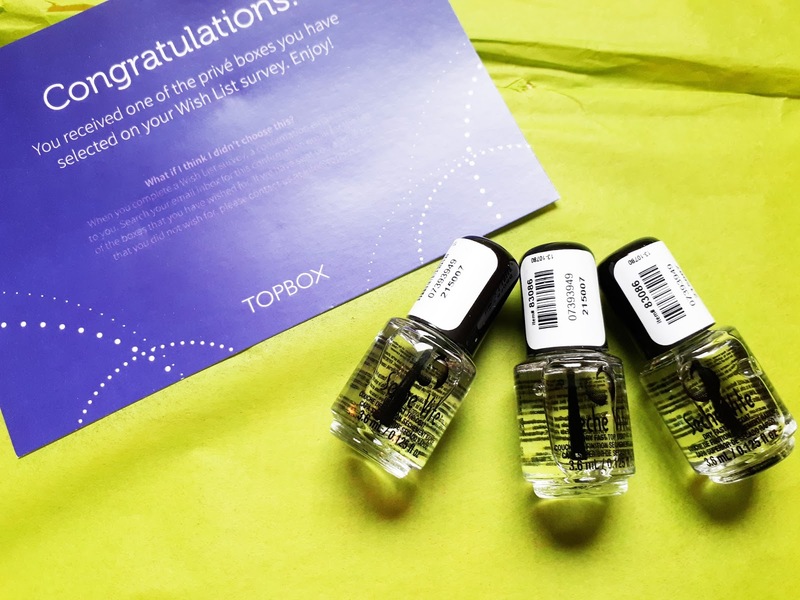 Topbox is probably the most affordable subscription service that I have ever subscribed to. It's only $12 a month, which means in Ontario it only comes to $13.56 after taxes. Super affordable. Especially for those who aren't looking to spend too much, while getting to try new brands. They usually only send sample sized products, and a lot of skincare. There generally isn't a theme of the month either, but it's always a great surprise. Each month we are able to pick a prive box, or a regular box. Usually I will post the prive choices we were given, but this month I forgot to take screenshots of our options. Oops! I decided to choose a prive box for November, and this is what I received. Seche Vite dry fast top coat is widely acknowledged as the world's finest top coat. Specially formulated to penetrate through nail lacquer to the base coat forming a single solid coating over the nail plate for a much more durable finish. Guaranteed not to yellow while leaving nails silky, stronger, and resistant to chipping and peeling. A full size is 14mL and retails for $9.95 at professional nail salons. I've heard great things about Seche Vite so I couldn't wait to give this a try. When I saw it as a prive, I decided to choose it because I wanted to see if it lived up to the hype. I have to say, I'm kind of disappointed in this top coat! I've given it quite a few tries and it just didn't live up to my expectations. It does dry fast, but it makes your polish shrink, and it definitely didn't prevent my nails from chipping or peeling. I noticed it actually chipped and peeled my polish very quickly. Like a day or two into a fresh painting. With my Essie or essence gel polishes, I get a good week of wear without any chips or peeling. And it's not like I do anything crazy with my nails either. We use a dishwasher now, and I have an office job.. so it's not like they should be getting ruined so quickly!